The South Korean capital of Seoul is a mega city with over ten million inhabitants. As such, space for infrastructure is at a premium so when the city needed a new bridge over the river Han in the early 1980s there was a simple solution offered by architects: build it on top of the existing bridge and make it a double decker. 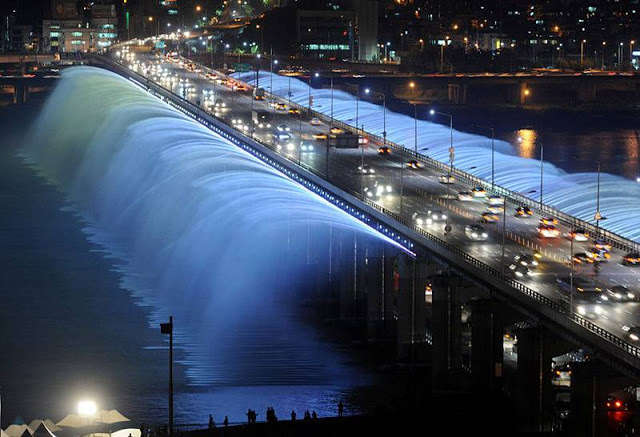 The citizens of Seoul Special City (to give the metropolis its full name) loved the bridge so much that six years ago they added the longest bridge fountain in the world.